Just thinking about how many printable paper files that I have made makes me dizzy. Even so, there is room for more and I will make more. Do I sell reams of paper? I do not sell this paper or any other paper in printed form. You may power up your printer and print the paper for yourself, for your students, and for your children. You may share the link to this page so that others may print these specialty papers. To Find What You Need: Decide which rule type - either plain rule "filler" or handwriting rule, and go from there. Browse the links in the blue sub-menu that is at the top of the pages or from the links listed below. Related pages are linked at the bottom of this page. Link code and images are supplied if you want to link to this page. To return to this page from anywhere at donnayoung.org, click on the menu items that are at the top of every page -- Handwriting and then Paper. This page has handwriting paper with color rule. Includes the lighter yellow stripe paper as well - See also Yellow Line. Yellow Line - A large selection of printable handwriting papers that feature a darker yellow lower rule space. Includes both horizontal and vertical handwriting paper as well as handwriting paper that omits the 3rd line. 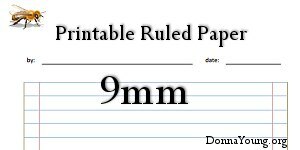 Double Line - Double Line Printable Paper features a rule that has two lines instead of three. Paper with plain rule, some have themes such as animals, history, or literature. My favorite is the vertebrae paper in Miscellaneous Themes . Paper with lines and margins. Includes spacer paper. 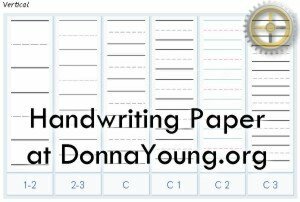 In Handwriting you will find both vertical and horizontal paper in several rule sizes and I have handwriting paper without the 3rd space. 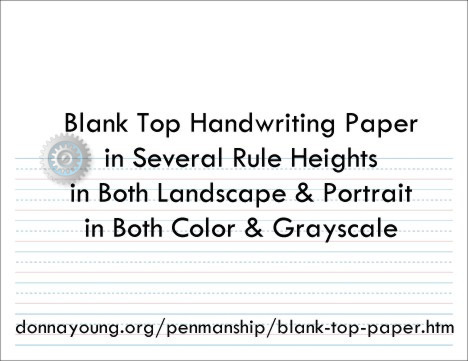 Along with vertical [portrait] handwriting paper, you will also find horizontal [landscape] handwriting paper. Blank top paper is sometimes called story paper. The top part of the paper is unruled and can be used for drawings. I have blank top paper in both handwriting ruled: Blank Top Handwriting and notebook ruled: Blank Top Filler. I also have blank top paper in Booklets, in art, and in science for nature journals. Copy and paste code below. 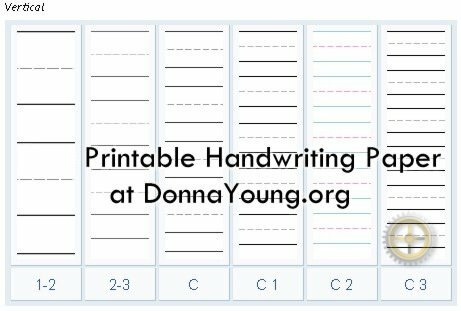 "Printable Handwriting and Filler Paper at Donna Young.org"